Do Low-Vol Funds Deliver On Their Promises? MPI has a new report out on Barrons looking at low-vol smart beta funds. The firm’s conclusion? Low-vol does deliver on its claim to keep volatility down, but outperformance is trickier. There’s book smart and there’s money smart, and sometimes those two things don’t coincide. That could be the takeaway from the latest data from risk analytics firm MPI (Markov Processes International, which reviewed how Ivy League endowments are performing this year. The answer is not great for many of America’s top schools. See more about these insights on Barron’s. Barron’s “Focus on Funds” counts Megan Woods’ “Risk Parity – What’s in a Name” amongst the “best reading in fund investing.” The piece, first appearing in FINalternatives, analyzes performance of risk parity mutual funds, finding a surprising disparity between offerings in terms of estimated asset exposure and implied leverage levels. A recent article published by Barron’s features commentary from MPI’s Daniel Li in a story on the Barron’s 400 Index and ETF (BFOR) following its biannual rebalancing. 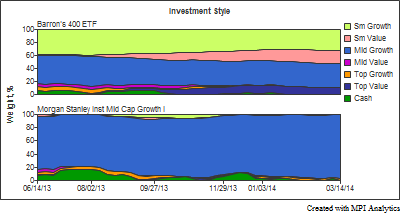 Li’s performance analysis shows the “growth-at-a-reasonable-price” ETF’s investment style exhibiting a small, though increasing, value tendency. MPI research collaborator Petter Kolm is quoted discussing the evolution of hedge fund replication and the potential role of the smart beta they can deliver in investor portfolios. Find the full article on Barron’s. MPI’s research on Rajiv Jain is deemed weekend reading by Barron’s.